The original Noddy Car sold for £29,000 at auction a few months back. 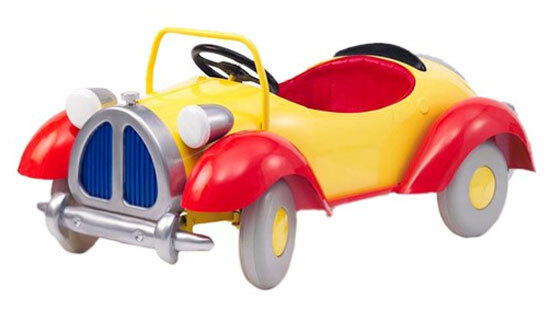 This officially licensed Noddy pedal car costs considerably less. But it is a replica of that original car for kids, built under license and made of ‘strong steel’, coated in high-sheen lead free powder coated paint and detailed with a comfy padded seat, black metal steering wheel, spare wheel mounted on tailgate, and three position adjustable push pedals that are perfect for growing kids. Suitable for ages 2 to 4 years approximately, it’s available for a discounted price at Hush Hush, which is another of those ‘discounted for a short time’ retailers. The price was £400, but you can pick this up now for £295.